Apple introduced a new color option for iPhone 7: Red. 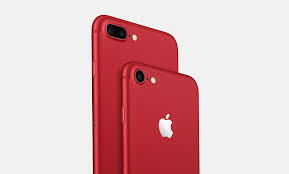 The New product (RED) iPhone features a red aluminium finish and is launched as a part of Apple's partnership with (RED). This new iPhone gives customers an unprecedented way to contribute to Global Fund and bring the world a step closer to AIDS-free generation. According to Apple, "For 10 years, our partnership with (RED) has supported HIV/AIDS programs that provide counseling, testing, and medicine that prevents the transmission of HIV from a mother to her unborn child. So far, we’ve raised over $130 million through the sale of our (RED) products. Now we’re introducing iPhone 7 (PRODUCT)RED™ Special Edition. Every purchase brings us a step closer to an AIDS‑free generation." The special edition (PRODUCT)RED iPhone will be available to order online worldwide and in stores beginning Friday, March 24. In India, It would be available in the month of April. Along with the New iPhone Apple also launched a new iPad and a new app Clips. The new iPad starts at $329. The new iPad is thicker and heavier than its predecessor but is faster too. The new iPad replaces the iPad Air 2. The new iPad does not support apple pencil.